When it comes to buying a new mouse for your gaming needs, there are 100’s of different mice to consider. How you choose the best gaming mouse for you is a very personal thing and not only depends on the size of your hands, but also on how you grip the mouse, and what type of games you like to play. I’ve been reading various reviews all over the internet so you don’t have to and compiled a list that might help you narrow down your own research. A gaming mouse needs a high quality sensor, adjustable CPI levels, and more than the basic 3 buttons that office type work requires. However, a first person shooter (FPS) gamer has different requirements from their mouse than a massive multiplayer online (MMO) gamer does, so that will also affect your decision. A FPS mouse doesn’t need to have lots of buttons, but it needs accurate tracking, must be comfortable in your hand, and will probably have a definite ‘click’ on the scroll wheel action. The Corsair Vengeance M65 not only has a programmable set of buttons, it also has a ‘sniper button’ which allows for instant change in DPI for more accurate aiming. It comes with removable weights so you can adjust the feel & balance of the mouse in your hand, which is important for your comfort. An MMO mouse needs a lot of buttons and the Razer Naga seems to be the most highly recommended MMO mouse I’ve seen. It has a 12 button thumb grid with mechanical switches to give a definite click feel and the mouse wheel has sideways movement, as well as the usual scroll motion. Every button is programmable so you can personalize and customize the Razer Naga to perform exactly how you want it to. Simple & ergonomically designed, the Razer Deathadder is highly rated as an RTS mouse. It has only a few extra buttons, has accurate scrolling, and the smooth design should suit most hand sizes and all types of grip. In some reviews, it’s also rated as one of the best all-purpose gaming mice along with the G502 (see below). As a female gamer, I struggle with some of the larger, heavier mice so the Kone Pure Optical gaming mouse is one that I will be looking at later this year. It’s smaller and lighter than some of the other highly rated Kone mice and it doesn’t have the pretty LED strip either. That means that more of the available surface is grippable and it keeps the price down a bit too. Logitech is a very popular and well known brand for gaming mice. This G502 Proteus Core has rave reviews and is one of the heavier mice on the market. It has up to 5 additional weights, which you can use to tune the overall weight and balance for best performance. This heavyweight gaming mouse also features all programmable buttons. It also has 5 DPI settings so you can quickly change the mouse sensitivity depending on what your game situation requires. If you like a larger, heavier gaming mouse then this one is probably your best choice. The one problem with gaming mice in general is their cost – I’ve always just used a basic 3 button $5 mouse, which might help explain why I’m so bad at some of the games I try to play! The Anker Gaming Mouse is currently on sale and is one of the best selling gaming mice on Amazon. If you don’t want to splash out too much cash, then this budget option mouse might be worth a try for you. If you don’t like the look of my top 6 suggestions, you can have a look at Amazon’s top selling PC gaming mice and pick from there. My top 6 PC gaming mice list is just the tip of the iceberg. There are 100’s of other mice available in multiple colors, sizes, and brands. We all have our favorite style but the best way to choose a mouse is to go to your local gaming or electronics store, and just try them out first. I usually narrow down my choices on Amazon based on reviews and price, then hit the stores to see if my chosen mouse feels comfortable in my small hands. Are you left handed? Don’t feel left out. 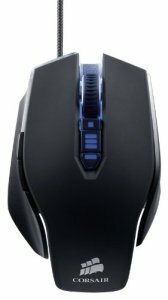 There are some Gaming Mice For Left Handed People too! What is your favorite mouse? Did it make my list?